These news unleashed quite a bit of discussion at the Evernote forum, especially because Plus and Premium users who have been paying for years don’t like a 40% increase in prices without any new feature. The idea is that we want you to use Evernote forever. Once you’re using it, we want you to keep using it, and it’s more important that you stay than you pay us. We want the engagement. The longer you use it, the higher the perceived value gets. And the higher the perceived value, the more willing you’re willing to pay. It’s up to us to make something that you want to pay for. The percentage of people who pay in the first month is like one half of one percent. But if they use it for a year, that goes up to seven percent. In the second year, it goes up to 11 percent. Our oldest cohort, the people who have been with us five years or so, it goes up to 25 percent. Of course, some say that free users are only a cost so their opinions are not important, but Phil Libin has been pretty good at explaining the opposite. The strict limit of two devices will break the flow of new users (and potential clients). I have been a Free, a Plus and a Premium user at different points, hence I understand the concerns of all users. The Evernote announcement contained a huge hint to something I didn’t fully realize before, i.e. that “regional pricing may vary”. Initially, I though of obvious small differences related to different currencies and rounding numbers. For example, Premium costs $70 in the USA which roughly corresponds to €63. The price in Italy is €60, but it is more or less the same. Evernote accepts PayPal payments, but only for supported currencies. Unfortunately, PayPal only allows Brazilians to pay using Brazilian Real as a currency. Therefore I took the time to use several servers of the VPN service I use daily, to check prices in the countries listed on the PayPal page. Basically, a Mexican Premium account has the same features but it costs a third of an American one. 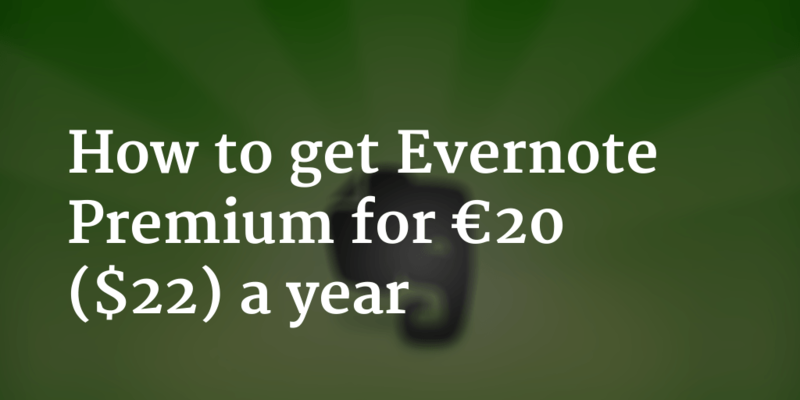 I tried to buy a year of Evernote Premium at the Mexican price and I confirm it works. The idea is simple: anyone can use a VPN service to connect to Evernote through a Mexican IP address and pay the 399MXN price. PayPal will also set up an auto-renewable subscription with the Mexican price, so you don’t need to repeat the process if you plan to buy the subscription again. Finally, you need to wait for a few minutes. Queste novità hanno scatenato un bel po’ di discussioni nel forum di Evernote, specialmente perché gli utenti Plus e Premium che hanno pagato per anni non apprezzano un incremento dei prezzi del 40% senza nessuna nuova funzionalità. Ovviamente, alcuni dicono che gli utenti free sono solo un costo e quindi le loro opinioni non sono importanti, ma Phil Libin ha saputo spiegare bene il contrario. Il limite stretto di due dispositivi distruggerà l’afflusso di nuovi utenti (e potenziali clienti). Sono stato un utente Free, Plus e Premium in momenti diversi, quindi capisco le preoccupazioni di tutti gli utenti. L’annuncio di Evernote conteneva un enorme indizio su qualcosa che non avevo capito appieno prima, vale a dire che “i prezzi per regione potrebbero variare”. Inizialmente, ho pensato alle ovvie piccole differenze relative alle varie valute e all’arrotondamento dei numeri. Per esempio, Premium costa $70 negli USA che corrisponde circa a €63. Il prezzo in Italia è €60, ma è più o meno lo stesso. 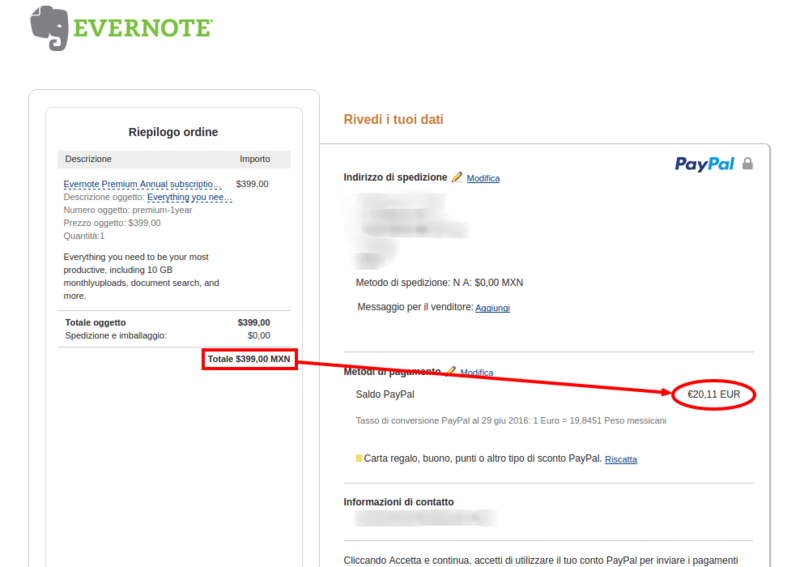 Evernote accepts pagamenti PayPal, ma solo per le valute supportate. Sfortunatamente, PayPal permette solo ai brasiliani di pagare usando il Real Brasiliano come valuta. Quindi ho speso un po’ di tempo per provare vari server del servizio VPN che uso quotidianamente, al fine di verificare i prezzi nei paesi indicati sulla pagina di PayPal. In sostanza, un account Premium messicano ha le stesse funzioni ma costa un terzo di uno americano. 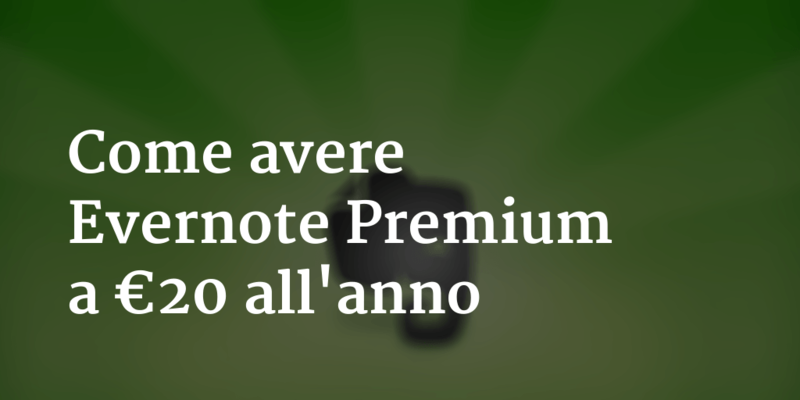 Ho provato a comprare un anno di Evernote Premium al prezzo messicano e confermo che funziona. L’idea è semplice: chiunque può usare un servizio VPN per connettersi a Evernote con un indirizzo IP messicano e pagare il prezzo di 399MXN. PayPal inoltre attiverà un abbonamento con rinnovo automatico usando il prezzo messicano, quindi non dovete ripetere il process se progettate di comprare l’abbonamento ancora. Infine, dovete aspettare alcuni minuti. Being students means to have to handle many things and all different: it is necessary to coordinate studying and amusing and being able to do it in a simple and fast way. This is especially true when you are abroad and there are more things to do than usual. As you know I spent January in Aabenraa in order to learn a bit of Danish, and now I attend the university in Lyngby. In these two months I have been able to observe some tools that are used by my peers, as well as to talk and exchange tips about that. I noticed that virtually all of us use more or less the same programs for our students’ routine because the laptop is a fundamental component not only for studying, but also for communicating. What matters most is that most of my friends don’t study IT, so I saw with my eyes the “normal” use of the computer as a tool and I decided to write this list of 10 applications. The common aspect of all the points in the list is only one: convenience. The average student does not have much time to waste, doesn’t need super-advanced features, wants to manage everything with a few clicks. For sure you already know some of the things I will list, but I would like to know why and for what we use them. It’s true, I start immediately with something that not everyone uses, but in my opinion it’s a pity. 😛 Ubuntu is an operating system alternative to Windows or Mac OS X. It’s fast, free and without viruses. I think it’s ideal for students because it’s modern interface is designed for the daily tasks that all students do: surfing the net, chatting, writing documents, creating presentations, listening to music, watching a movie. All of this in an extremely covenient way and with the possibility to install thousands of software with a click. Try it! There are some browsers that are more widespread than others, but I was surprised to see that 90% of the students I have met use Google Chrome. It’s a quite high percentage! I have always used Firefox, but I tried to think why Chrome is so common. Finally I understood that it’s because of its convenience. The fact that Firefox is more powerful and extendable for specialized tasks is not important, what matters to many is just that the browser loads quickly. The fact of having an integrated PDF reader is another advantage. Personally I started to use Chromium because it is its open source version, but now I have installed Chrome for its PDF support and the flash player that works a bit better. This web service gives 2 GB of free space in the cloud, that can be easily extended by inviting friends to join. You can have access to your files safely using the web interface and automatically synchronize them with the client for all operating systems and for mobile devices. In addition to synchronization, it also gives you the automatic backup of files up to 30 days before: if you delete or edit a document by accident, recovery is just a click away! Also, the sharing features are very useful. The best thing to do is simply creating a University folder in Dropbox and saving everything in it. It’s difficult to exactly define Evernote. It isn’t only a website in which you can write notes, but it also includes a client software for Windows and Mac (under Linux I use the web interface and I am fine), apps for phones and tablets and extensions for the browser. Notes can be divided in notebooks — for instance one for your documents and one for every class you follow — and labeled with tags. The real potential of Evernote shows up when you use it along with the two official browser extensions. The first is called Web Clipper and allows you to “clip” a part of a webpage and save it with one click inside Evernote, when it immediately becomes indexed and searchable. The second extension is called Clearly and allows you to have a readable and distraction-free view of any articles you find online. The extension isolates the important content and eliminates all the rest, allowing also to save the page in Evernote and automatically deciding the most relevant notebook. At first sight it may seem that this computational search engine is useful only for people studying maths, computer science or engineering. It’s true, You can perform very complicated computations with it, but that’s not all! Wolfram|Alpha includes search functions for many other fields: statistics, geography, chemistry, music, linguistics, astronomy, earth sciences, medicine… the list of examples is very long. I have been using this site from where I was in the last years of high school and I can guarantee that it is very useful. What would you think if I told you that my favorite search engine is not Google? Just so, most of the times I use DuckDuckGo, a very convenient search engine that gives a very useful feature: the instant answer. When you search for something that can cleary be found on Wikipedia, StackExchange, Wolfram|Alpha, Twitter or many other sites, DuckDuckGo shows it to you as the first result in a highlighted box. This saves a lot of time. Some love Facebook, others hate it. Many use it to “waste time” between games and funny pictures. The reality is that this social network reveals its real usefulness when you are abroad, I noticed especially after the Danish course. Facebook is fundamental for keeping in touch with friends in your country and the “colleagues” that then spend the Erasmus in other cities. By living abroad you will end using Facebook for silly things (if you are already members) and you will start to use it for what it was designed: communicating, staying updated about events and handling your network of friends. Of course going abroad means keeping in touch with people in your own country. There are many VoIP services, but Skype is for sure the most famous of all. It allows you to perform free chats, calls and videocalls through the Internet using a computer or smartphone. In addition to this, if you are in need, it gives a low cost call service to landlines and mobile phones. Ironically from when it has been bought by Microsoft it has had a more updated Linux version, not bad! Given that it recently launched also in Italy, I think it’s the best moment to talk about it! Spotify is a music application that combines social features with a huge songs library. The best thing is that by using the program and an Internet connection you can listen to millions of tracks for free. There are some limitations on how much monthly hours you can use and some advertisements, but they absolutely don’t give hassle and you can exactly choose which songs to play, skipping from one point to another in any moment. if you are in one of the 24 countries where it is available, try it and you will not regret! This application is dedicated to those living in Denmark, but I am sure that there exist some similar in many countries. In general, you should search a service that allows you to search the trains and buses you need in the country where you study. Rejseplanen allows to set two arbitrary addresses of departure and destination and shows some suggested connections, with the possibility to see the tariff zones in which Copenhagen is divided. If you don’t live in Denmark you can try the site and the application of the German railways, containing the routes of all Europe.